Ever since the end of Season 9, many Doctor Who fans have been torn between mourning the loss of Jenna Coleman as the Doctor’s companion Clara and wondering just who could replace her in Season 10. Clara was a beloved companion and the young woman who helped fans transition from Eleven to Twelve, so her successor has some big shoes to fill. We don’t yet know who will next be joining the Doctor in the TARDIS with Peter Capaldi, but we do know now when we’ll find out. The BBC will be releasing the name of the actor playing the next companion during the halftime of a soccer – or football, for the non-Americans – game on April 23. Brits will be able to tune in to the game between Everton and Manchester starting at 10:15 a.m. ET on Saturday, according to RadioTimes. Halftime can be expected around an hour or so later, so Who fans who aren’t soccer/football fans won’t need to watch the whole game. Those individials who work on Doctor Who have kept pretty mum about candidates for the role of the next companion, but there have been a few hints dropped. 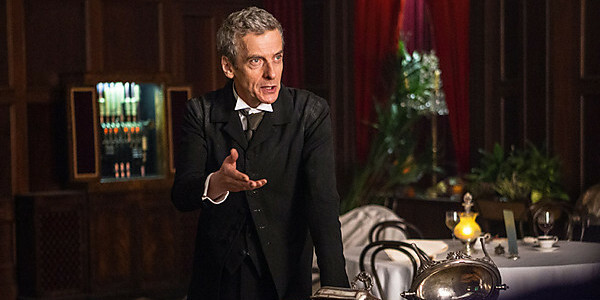 When Peter Capaldi revealed that the actor had been officially cast, he also revealed that it happens to be somebody with whom he has worked in the past. Given that Capaldi has had a long and prosperous career, the admission that he’s worked with his new costar in the past doesn’t mean that the list is short. It does help with ruling some candidates out. EastEnders actress Rakhee Thakrar was rumored for the part, but she doesn’t seem to have the connection to Capaldi. Peter Capaldi has also mentioned that Doctor Who was interested in multi-cultural casting, so the show may be diversifying for Season 10. There’s no saying just yet whether the new companion will be a man or a woman. Capaldi expressed a desire to not have a male companion, but it’s entirely possible that the show might want to change things up even further after Clara. Who has only had one regular male companion since it returned to the airwaves in 2005, so perhaps the Doctor’s next time travel pal will be a guy. Season 10 is unfortunately still a ways off, so it’ll be a while before we get to see the next companion in action with Peter Capaldi. Still, some news is better than no news, and this Saturday’s announcement of the casting decision is definitely worth getting excited over--although some Who fans in parts of the world may just have to wait for the Brits to hit the web to share the news. We may not be getting new Who material in the particularly near future, but there’s still plenty of good shows to catch on the small screen. Take a look at our schedule of summer TV premiere dates to see when your favorite shows are returning.